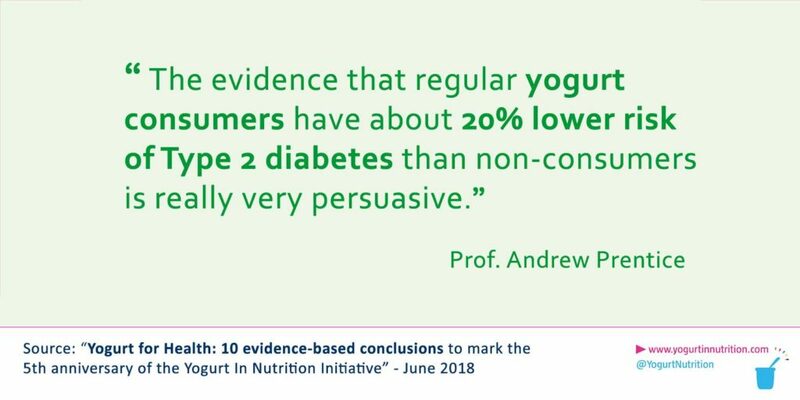 “Yogurt consumption is associated with reduced risk of Type 2 diabetes” is one is one of the 10 evidence-based conclusions made by the YINI board about the health effects of yogurt… learn more below. How might yogurt reduce T2D risk ? Live bacteria in yogurt can improve the composition of the gut microbiota and this may help to reduce inflammation, which is linked to T2D. Yogurt consumers are less likely to have unhealthy lifestyles that are linked to T2D. The risk of T2D has been shown to fall by 7% for each 10 μg increase in dietary vitamin K2.Whole-fat yogurt contains up to 28μg of vitamin K2 per 100 g serving. Yogurt is a low glycaemic index food, suggesting that it does not cause a spike in blood glucose levels after a meal. Researchers analysing UK data have predicted that if the adult population increased the amount of yogurt they ate by one serving per day, they could generate savings to the National Health Service of £140 million over five years through reductions in the incidence of T2D. Lenoir-Wijnkoop I, Mahon J, Claxton L, et al. An economic model for the use of yoghurt in type 2 diabetes risk reduction in the UK. BMC Nutr 2016;2:77. Pei R, DiMarco DM, Putt KK, et al. Low-fat yogurt consumption reduces biomarkers of chronic inflammation and inhibits markers of endotoxin exposure in healthy premenopausal women: a randomised controlled trial. Br J Nutr 2017;118:1043–51. Wen L, Duffy A. Factors influencing the gut microbiota, inflammation, and type 2 diabetes. J Nutr 2017;147:1468S–75S. Beulens JW, van der A DL, Grobbee DE, et al. Dietary phylloquinone and menaquinones intakes and risk of type 2 diabetes. Diabetes Care 2010;33:1699–705. Walther B, Karl JP, Booth SL, et al. Menaquinones, bacteria, and the food supply: the relevance of dairy and fermented food products to vitamin K requirements. Adv Nutr 2013;4:463–73. Wolever TM. Yogurt is a low-glycemic index food. J Nutr 2017;147:1462S–7S. Could a yogurt a day keep diabetes away – and protect our heart and blood vessels?